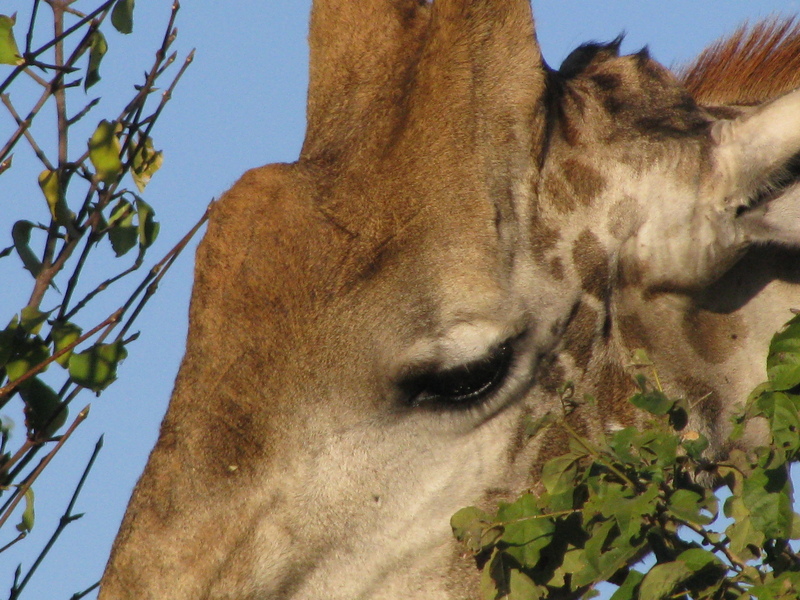 Giraffes seem like such peaceful creatures, which can be seen in their eyes. This entry was posted in Travel Photos and tagged 50 Year Project, Africa, Botswana, Chobe National Park, Giraffe, Giraffes, Life, Nature, Photography, Travel, Travel Blog, Travel Journal, Travel Photo, Wildlife. Bookmark the permalink. There does seem to be a hint of sadness…I bet their lives in the wild aren’t easy. Oh my goodness—I want one!!! I agree that their eyes are cow/deer/horse like!!! You can get lost in them!!!! Pools of liquid emotion!!! What a great, close up shot. They sure have gentle eyes. It feel as if you can cuddle them. I know what you mean. They are gentle souls. How did you get so close? Do you have a good zoom on your camera? My zoom is decent, but I was surprised how close the jeeps could get to the animals. I couldn’t reach out and touch the animals, but we were closer than I imagined we would be. It’s amazing that you got such a closeup shot! Wow! I imagine one would still need to keep a pretty good distance so as not to get in the path of a kicking leg or their head swinging around. I’m trying to picture getting whacked with his neck. That would be kinda funny. I agree, giraffes have lovely eyes and they’re lashes are so rich and full. I think ostriches and emu’s have pretty eyes too. I haven’t seen too many ostriches or emus. When I do though, I’ll be sure to check out their eyes. Looks like it’s in the middle of some sort of deep reflection – in reality I suppose it’s just enjoying munching on the leaves! He seemed like the leaves were delicious.